I’m delighted to announce the publication today of my new paper “Xenoposeidon is the earliest known rebbachisaurid sauropod dinosaur”. This is the peer-reviewed version, in my favourite journal PeerJ, of the manuscript that became available as a preprint eight months ago — which was in turn a formalisation of a blog-post from 2015. Taylor (2018: Figure 3). Autapomorphies of Xenoposeidon proneneukos NHMUK PV R2095, mid-posterior dorsal vertebra, highlighted in red. A. anterior view. B. left lateral view. Numbers pertain to the numbering of autapomorphies in the text. 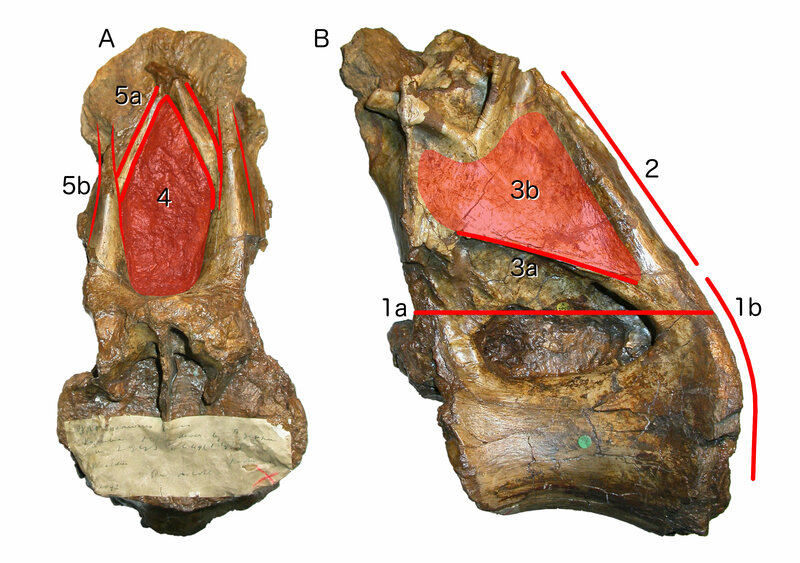 1a, neural arch covers whole of centrum, and 1b is contiguous with posterior articular facet. 2, neural arch is inclined forward by 30–35 degrees relative to the vertical. 3a, inclined ridge-like lamina marks ventral margin of 3b broad featureless area of bone. 4, large teardrop-shaped anterior fossa. 5a, vaulted laminae bound this fossa, but are not the medial CPRLs (5b, drawn in finer lines), which continue up to the presumed location of the prezygapophyses. In a sense, then, this paper is old news. It doesn’t contain any startling new insights that readers of this blog wouldn’t already have been aware of. But it’s become more rigorous, better argued and justified, better illustrated (the image above is one of two new figures), and generally toughened in the forge of peer-review. It’s also now, of course, officially part of the scientific record. I’m delighted about this paper for several reasons. First, of course, because Xenoposeidon is a beautiful specimen and now turns out to be rather more important than I’d previously realised. Second, because I hope this paper’s inclusion of the high-resolution full-colour 3D model as a supplementary file will help to establish this as common practice. But also third, because it’s my first paper in ages. Taylor 2014 is essentially an addendum to my and Matt’s PLOS ONE paper the year before. Upchurch et al. 2105 is a significant and substantial piece of work, but almost all the credit on that one is due to Paul and Phil. Taylor 2016 is more of an advocacy piece than a scholarly paper. Ansolabehere et al. 2016 is merely a report summarising a multi-day discussion, and I am in any case only one of nine(!) co-authors. I need to get the preprint on the incompleteness of sauropod necks through peer-review … I’ve been sitting on perfectly good peer-reviews since October 2015, which is just inexcusable. Likewise for the preprint on the neck of Barosaurus, for which I got the reviews in September 2016. And of course I really really need to get the Archbishop paper written. That’s not even mentioning other long-in-the-works projects like the descriptions of “Apatosaurus” minimus and “Biconcavoposeidon”. Sheesh. I’m so lazy. Nearly as bad as Darren. Wait, you got the reviews back in 2015-2016? Most of the juournals I send things to will reject the paper if the response isn’t back within 1-5 months unless you provide them with extenuating circumstances (e.g., the reviewers demand you provide photos of a specimen in a far-off institution you weren’t planning on visiting). Yep, I don’t really know why, but both submissions are still open. So my plan is to make the required changes and resubmit: the worst case is that they treat it as a new submission, after all.